Hi i am Hallie. 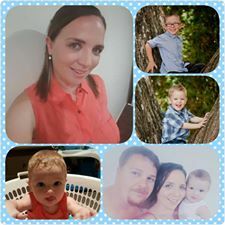 I’m 27 and a mother to 3 boys and 2 Angel babies. I suffered PND with my first but didn’t realize it till just before I had my second. My first bub (who is now 6) is/was to my first husband who at the time was never around was also extremely controlling and manipulating. I had no family and had very few friends here is QLD. So as a young first time mum doing it all on my own I really struggled. With my second to my new/current husband (my high school sweetheart) things became worse after I had him. I would cry all the time and for no reason. He’d come home and I wouldn’t want him to come near me or touch me, I just wanted to be left alone. I finally gave in and realized I needed help so sought-after a social worker and she referred me onto Peach Tree, where I not only met some wonderful ladies whom I’m still friends with but can relate to. Finally after 3 and a half years off and on of going to group have started to open up and share my story. I refuse medication but see a psychologist on a regular basis and discovered that my problems go as far back to my childhood when I was about 8 and my mother left me and moved away. I have never really had that mother’s influence in my life and spent most of my childhood being manipulated by my father.